Are you a renter thinking about moving? Do you own a pit bull? As you can probably imagine, apartment hunting with a dog is a bit more difficult than apartment hunting without one. Many landlords don’t want to deal with the liabilities that come with renting to tenants with animals. This is especially true if that animal is a pit bull or bully breed dog. As pit bull owners are unfortunately well aware, bully breed-type dogs often face breed discrimination. As unfair as it may be (and as hard as we are trying to change the status quo! ), it is likely something you, as a pit bull owner, will have to consider. Read on for our best tips on winning over those landlords and getting your fair choice of living quarters. Take your time. While many landlords are not dog-friendly, there are plenty that are. It just might take a bit longer to find them. If time permits, it is a good idea to plan ahead and be persistent in your search. 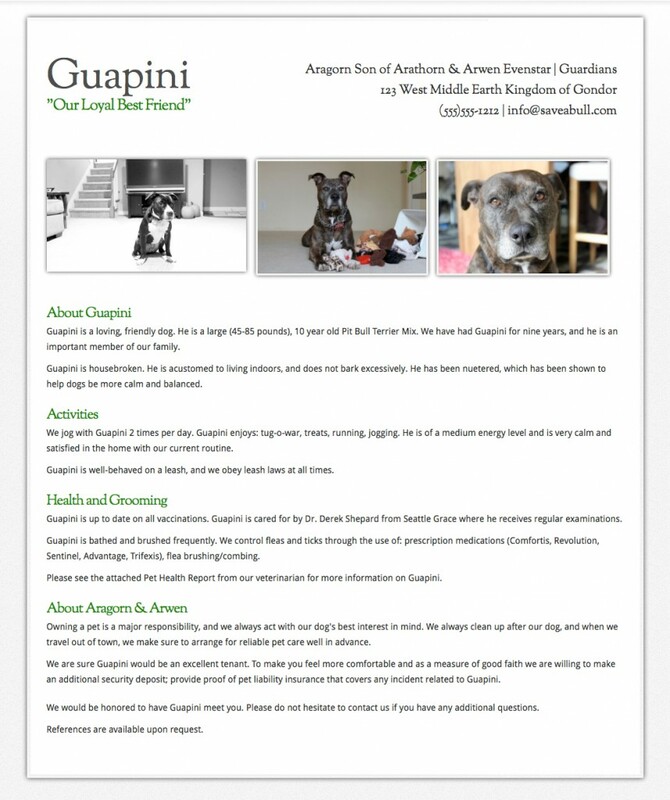 Include a pet resume with your application. 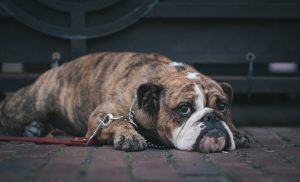 This can be especially helpful if you are attempting to sway a landlord who might not be normally willing to rent to tenants with dogs. It will show that you take pet ownership seriously and will directly address any concerns he/she may have. Also include letter(s) of recommendation. Along with your pet resume, consider attaching a couple of references from your current/past landlords, neighbors, groomers, and trainers who knew your dog, driving the point home that you are a responsible dog owner and your dog is properly trained and well-behaved. Meet and greet. If you are in a position to visit the landlord in person, it can be to your advantage to do so – with your dog, of course! It’s easier for landlords to decline dog owners over the phone or email, but harder if they meet you and your well-behaved dog in person. Be courteous and schedule an appointment first; dropping in unexpectedly will probably not be appreciated by most people! If you aren’t able to meet the landlord in person, be sure to include some high-quality photos of your dog with his/her pet resume. Offer an additional pet security deposit. Again, this will likely help ease the landlord’s mind over potential concerns and further catapult you into “ideal tenant” territory. Consider renter’s insurance. Be sure to buy a policy that covers your dog and make that clear in your application. Be honest. Don’t ever try to hide your dog or sign a lease that does not allow dogs. As cliche as it may sound, honesty is the best policy! You surely don’t want to risk being turned in by neighbors or found out by your landlord and potentially be evicted. It’s worth it to wait until you find a place that welcomes you and your pit bull. Hold up your end of the bargain. 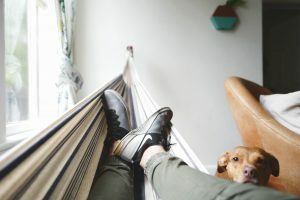 After all the campaigning you’ve done for you and your dog to be accepted as tenants, you must follow through and be an exceptionally responsible pet owner! Be respectful of your neighbors, pick up after your dog, keep him/her on a leash, etc. Doing so will set a positive example for those around you (serving as a breed ambassador) and you will hopefully be able to use your landlord as a reference for the next time you move. We hope that you find these tips useful in your apartment search. If you think we missed anything important, please feel free to let us know in the comments! 1. Drug detection. Their ability to sniff out dangerous drugs makes pit bulls excellent police dogs. A pit bull named Popsicle (he was found in an old freezer where he was left to die after being used as bait for dog fights) has the largest recorded single drug find in Texas history – over 3,000 pounds of cocaine with a street value of nearly $1.4 million. 2. Explosive Detection. Some dogs have a talent for detecting explosives, which makes them perfect for military service. A pit bull called Sergeant Stubby, for example, has been called the most decorated war dog of World War I and the only dog to be nominated for rank and then promoted to sergeant through combat. Stubby served for 18 months and participated in 17 battles on the Western Front, where he was wounded in action twice, saved his entire platoon by warning them of a poison gas attack, found and comforted the wounded, and single-handedly captured a German soldier. 3. Search and rescue (SAR). Pit bulls Cheyenne, Dakota, and Tahoe are top-rated SAR dogs. The dogs have helped save the lives of many people over the years. They are so good, in fact, that Dakota and her owner Kris Crawford were requested by NASA to assist in the recovery of astronauts after the Space Shuttle Columbia disaster in 2003. Kris and her dogs were even awarded the President’s Volunteer Service Award in recognition of their valuable contributions to the community for over a decade. 4. Therapy/emotional support. Pit bulls’ gentle, affectionate nature make them wonderful therapy dogs, and are frequently used to help veterans who have been diagnosed with PTSD as well as people with other mental or physical illnesses. Check out therapy dogs Zen and Blueberry. There are a number of organizations across the nation that are dedicated to training pit bulls for the workforce. Pits for Patriots for example, specializes in training qualified pit bulls from rescues and shelters in the Chicago area to work as service, therapy, skilled companion, and companion dogs for U.S. military veterans and first responders. Animal Farm Foundation, whose mission is to secure equal treatment and opportunity for pit bulls, has formed a collaboration with Austin Pets Alive! and Universal K9 so that rescued and sheltered pit bulls can be selected and considered for detection dog work, which is traditionally reserved for purebred, purpose-bred dogs. It is because of efforts like these that pit bulls are able to prove themselves as treasured members of the modern workforce, fighting the stigma one dog at a time. Not all dogs are fortunate enough to grow a thick winter coat or fur around the pads of their feet when the weather starts to get colder. Short-haired dogs are often not genetically suited to live in extremely cold climates and are, therefore, more prone to cold weather-related conditions such as frostbite or hypothermia. Our beloved pit bulls have wonderfully short, low-maintenance hair that can pose a challenge in the winter months. Read on for tips on how to protect your dog from the elements. Sweaters add an extra layer of warmth to your dog’s body, somewhat mimicking the thick winter coat that other long-haired dogs are able to grow. Sweaters are great for your dog to wear indoors or outside when it’s not raining or snowing (a wet sweater will only make them colder). Make sure the garment fits properly in the neck, chest, and shoulder areas and isn’t too tight. Also be sure that the sweater isn’t covering the dog’s elimination area so that they can still “go” freely. If you’re scoffing at the idea of dressing your dog, keep in mind that dogs are sensitive to temperature changes just as people are, and might need a little extra warmth to be comfortable. While sweaters are ideal for indoors or dry conditions outdoors, wet weather may require something a bit more heavy duty. A thick, durable, insulated winter jacket may be just what your dog needs to enjoy outside activity in the rain or snow. As with sweaters, be sure the jacket fits properly and is not covering the elimination area. Booties can help protect the pads on your dog’s feet from getting frostbite. Many long-haired breeds have evolved to grow heavy fur on their feet to protect their pads from the cold, but pit bulls (and other short-haired breeds) do not have that option. Dog booties are especially important to consider if you live in an area with snow. Some dogs don’t like wearing booties, however, so be sure to clean off their bare paws after they walk outside in the snow. Antifreeze and other snow removal chemicals on the ground can be toxic if ingested, and salt can become an irritant. Keep your dog feeling warm and secure with a heating pad or heated blanket for his/her bed. Keep the heated pad or blanket on one of the low-medium settings to avoid overheating. Heating pads aren’t generally too expensive (around $20-$40 each) but if you don’t want to buy one, give your dog extra blankets to snuggle into and keep their bed away from drafty doors or windows. Bathe your dog inside with warm water and make sure he/she is completely dry before going outside. Your dog actually may require fewer baths in the winter months, due in part to less physical activity outside, but if you do give your dog a bath, remember that it takes longer for their fur to dry in cold weather. Giving him/her a quick blow dry may do the trick! 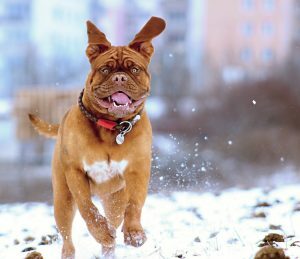 Indoor dog parks are a great option for exercise in the winter months. It will give your dog a chance to release some pent-up energy and socialize with other dogs while staying safe from the elements. 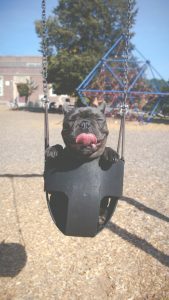 If there isn’t an indoor dog park in your area, some doggy daycare centers will allow playtime sessions at their indoor facilities. Exercise is still important, even in cold weather! October is National Pit Bull Awareness Month! 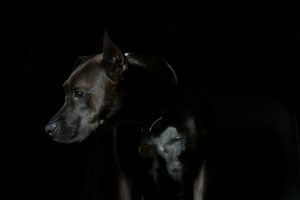 While there is a National Pit Bull Awareness Day as well, there is a bit of uncertainty as to which day it actually is (some sources say October 27, others say October 24, and even others say the last Saturday in October). In any case, we’re going to celebrate all month long. Share positive stories, photos, videos, and other information about pit bulls. You can do so online via your personal social media accounts or email and when you’re speaking to other people in your daily life. The more positivity and love we spread, the more we will get in return. Attend a Pit Bull Awareness Month event. Some animal shelters and rescue groups host festivals, charity walks, meet-ups, and other celebrations during October. Even if you don’t own a pit bull, it’s a good opportunity to get out and meet some! Check your local shelter or rescue group for upcoming events. No event near you? Plan your own pit bull party! Invite friends, neighbors, and other community members to come and bring their pits for an afternoon of fun. 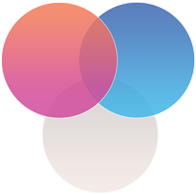 Check out this site for event planning ideas. Do something to help. Make this the month you sign up to volunteer at a local animal shelter, commit to fostering a pit bull in need of a home, or donate supplies to a pit bull rescue group. Many rescue organizations rely on donations and volunteers to keep running, so what better month to get in on the action? Take action in your local or national government. 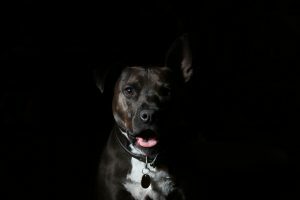 Reach out to politicians about animal rights, especially as it relates to pit bull-type dogs, and let them know that discrimination will not be tolerated. This is particularly appropriate if there is currently any sort of breed-specific legislation pending or already in place in your city. Write a letter, send an email, make a phone call, sign a petition…do whatever you can to make sure your voice is heard. If you happen to live in area where BSL is not in place or has been turned down in the past, send your local councilmembers a thank you note. Remember that we’re aiming to spread as much positivity as possible this month and it would be nice to recognize those leaders that actively work against BSL. If you’re a pit bull owner, set an example for others. Be a breed ambassador. Make the choice to gently inform and educate others at any opportunity you might come across. While this is a time to celebrate pit bulls and other bully breed dogs, make sure you are not bringing down another breed in the process. We are here to end unfair judgment and stereotypes, not to perpetuate new ones. Be kind and loving towards all animals and their owners.